Effective Patterns: #20-22 Mercury Midge, #18 Egg Patterns, #20-22 Manhattan Midge, #20 Pale Olive Midge Larva, #22-24 Black Beauty, #22-24 Bling Midge, #22-24 Top Secret Midge, #22-24 Minute Midge, #22-24 Jujubee Midge, #22-24 Matt's Midge, #22-24 Griffith Gnat, and #24-26 Parachute Adams. The Williams Fork River is a top-notch fishery of its own. 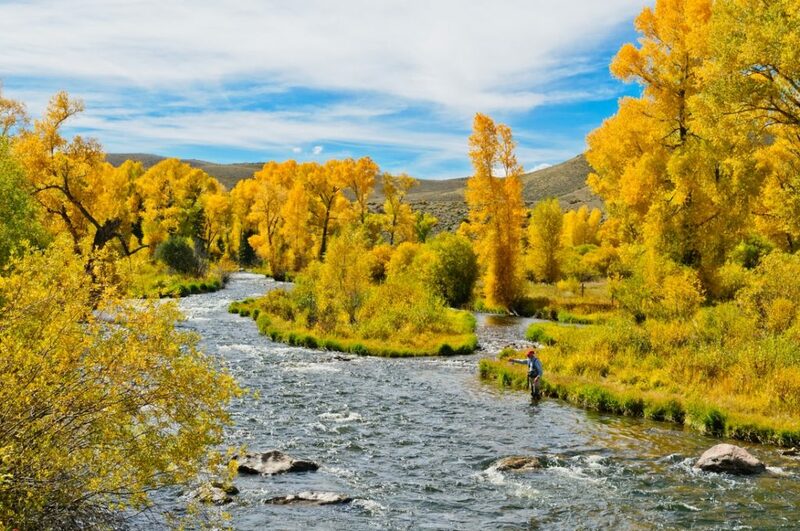 This beautiful fishery is nestled between the Williams Peaks and Middle Park and is truly a fly-fishing paradise. The two-mile stretch between the upper boundary of the Kemp Unit and the confluence of the Colorado River is a mixture or riffles, runs, and pocket water with one of the best populations of brown trout in the “west”. A 30-minute hike to the river keeps the crowds to a minimum. Anglers can catch trout with a variety of methods including nymphs, streamers, and dry flies. The hatches include caddis, blue-winged olives, midges, Tricos, and red quills. Being a tributary of the Colorado River-spring and fall-spawn runs bring some “lunkers” into the stream. Ideal flows for the “Fork” are between 100 and 250 cfs. The regulations are flies and lures only and all fish must be returned to the water immediately. The Williams Fork is one of the prettiest places on the planet. This Williams Fork is proof that trout don't live in ugly places. Flows are excellent considering the time of year. Anglers should prepare themselves for intermittent hatches of midges. Dead drifting tiny midge larvae and pupae in the slow, deep pools is your best bet right now. Egg-midge combos are one of the most effective strategies. Matt’s Midge, Parachute Adams, and Griffith Gnats are fooling a few fish on the surface during the height of the hatch. If you look for them, you’ll find a few rising fish in the slower pools and tailouts.